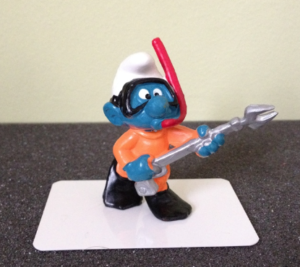 This smurf is sometimes referred to as Frogman. This was the name National gave the smurf when it was first released in the UK back in 1981 and for some collectors the name has stuck. Wearing his orange wetsuit, black flippers & goggles, red snorkel and a silver spear gun. There are not many variations of Diver, the main difference appears to be with the tip of the spear gun with some curving forward or back. However this is most likely how the smurf has been stored as the tip is quite flexible. 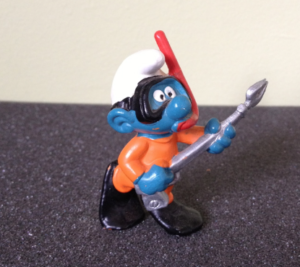 Diver was one of the last smurfs made by Bully back in 1979. In 1980 Schleich had the rights to produce all the smurf figurines, so they continued to sell Diver with Bully markings right up until 1984. After 1984 Schleich removed the Bully marking and added their own marking under the flippers. Schleich continue to sell Diver up until 1990. Diver was also made out of Hong Kong and was sold in Australia, possibly New Zealand and in America. In America Wallace Berrie only sold Diver for two years, 1982 to 1984. So it is possible to find with Hong Kong markings and also Hong Kong W. Berrie markings. There are appears to be very little differences between the W.German and Hong Kong versions as it appears they both used the same mould but like a lot of smurfs produced in the early 1980’s the difference lies in the type of paint used. For example the Diver sold in the UK was typically painted in Portugal (mustard paint dot) and has matte paint colours. The Hong Kong ones were painted with darker shiny paint colours. Diver was also painted in Tunisia, so possible to find with a green paint dot. Like many smurf collectors, I have a ‘Most Wanted’ List of smurfs that instead of decreasing in size appears to get bigger everyday. There are two Diver smurfs that are on this list and they include a Spanish (CNT) Diver in an all red diving suit, flippers and goggles. The other is often referred to as ‘Prototype’ and displays Diver with flat feet compared to the ‘regular’ Diver which has it’s back foot raised. I am pretty confident that I am not the only one out there that would love to have this ‘Prototype’ Diver. 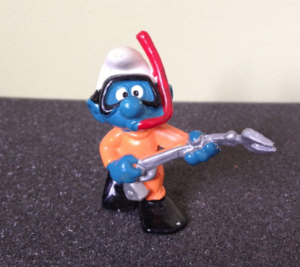 In 2000 Schleich released a new generation of smurfs including Scuba Diver (#20466). Though they may share a similar name both Divers are very different from each other, making both worth collecting. I am a big fan of both, though if I had to chose I would probably say Diver is my favourite just because of his expression on his face, especially his eyes. The smurfs made back then seem to have more of a comic disposition to them compared to the smurfs made in the last twenty years.